If you’ve never imagined that trolls are an actual “thing” to people in Scandinavian countries, read this. Honest to Pete, you will come to believe this troll is as real as your dog or, more disconcertingly, your husband or wife. It is haunting, marvellous, and really refreshingly different, and confronts the reader with questions about the nature of love and alienation. It is no fairy-tale, nor is it a fantasy, though it is about a troll. A troll is a class of being in Norse mythology and Scandinavian folklore, classified somewhere between a smart animal and a cave-dwelling humanoid. Despite today’s globalized world of connected technologies and electronic media, there are ancient folkloric beliefs that are alive and well in Iceland, for instance. Anecdotal evidence shows that more than half of Icelanders believe in elves and “hidden people”, elf-like “Huldufólk” who live amongst the lava rocks, or at least don’t deny their existence since it is considered bad luck to do so. Similarly, there are people in Finland who believe that trolls are real – or just want to believe trolls are real. Every country in the world has its mythical beings, and so long as people have story-telling and imagination, that will continue, helped along by mass communication and imaging methods. The Finns, in particular, have trolls. 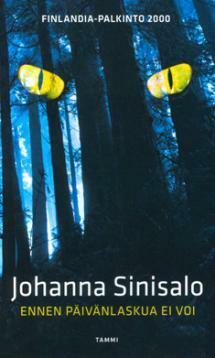 One of my favourite authors, Sjón, recommended Sinisalo’s work, so I got it and read it though it was first published in 2000. I got the idea that the troll in the novel was a metaphor for the strange or the foreign elements amongst us in society, and how we tend to reject those. This concept is even more relevant now than it was at the time of the book’s first publication. When faced with any non-conforming new being in our neck of the woods, we are likely to be first dubious, then aggressive. This novel is sub-titled “a love story”, and that should warn readers. That, and the hairy little hands (feet? ), sticking out of a pair of pants on the front cover! This, dear reader, promises to be interesting. Sinsalo’s modern masterpiece, which was also was her debut novel, took a long time to hit the mainstream market, and be fully appreciated, but it will be, probably forever, one of those books that stands alone, on its own considerable merit, and cannot fit into only one genre. 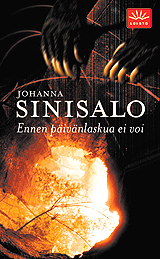 Sinisalo won the prestigious Finlandia Prize for literature for it, in 2000, published under the title Ennen päivänlaskua ei voi (translated as Not before sundown). 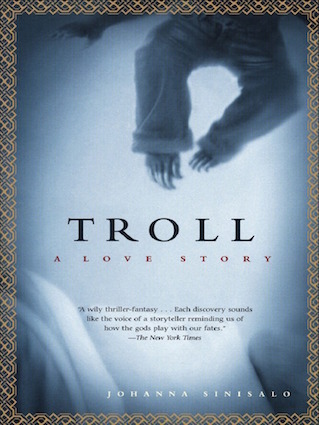 In 2004, when it was republished as Troll — A Love Story for the American market, it won the James Tiptree Jr. Award for gender-focused Science Fiction and Fantasy. Despite being translated into 13 languages, including Spanish, Japanese and Lithuanian, in English the novel retains the markers of Finnish fiction, so well done to translator Herbert Lomas. These are: a crisp, somewhat austere use of language overall combined with instances of lyricism; rationality contrasted with the eccentric; social criticism and themes of loneliness and rootlessness; some use of rhythmic metre – for instance, the repetition of key phrases; a focus on Finnish, not Swedish characters and settings; and a mixing of genre conventions. Sometimes an entire chapter is only one line or a few lines – particularly when it is a critical moment. 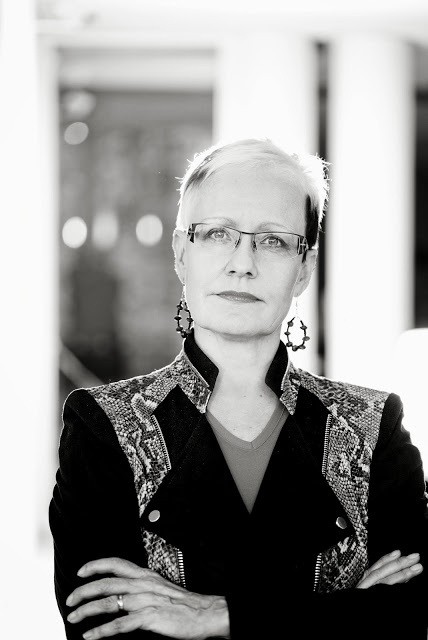 It is with good reason that Sinisalo is called the “Queen of Finnish Weird”. The name of the book is from a Finnish song Päivänsäde ja Menninkäinen by Reino Helismaa, and recorded by Tapio Rautavaara, which has the lyrics: “Kas, menninkäinen ennen päivänlaskua ei voi milloinkaan olla päällä maan” (translated as “A troll cannot ever stay above the ground before sundown”). It is, I would say, for adult readers who can take a bit of a shock to the system. The main character, “Angel” (“Mikael”), is gay and the novel opens with him being rejected by the object of his affections while at a restaurant. The fact that he is gay has nothing really to do with the rest of the plot, I think. It just takes a few pages for the reader to put A and B together and get the hang of the characters, especially since Angel also looks as girlishly pretty as an angel. Angry and sad and on his way home, he passes a group of rough guys who are kicking something on the pavement – a “juvenile” troll, as it turns out. Very factually, a “juvenile” is a term in developmental Biology to describe a young, not fully developed animal. Throughout, Sinisalo does not use any of the usual mechanisms of Science Fiction or Fantasy. She has no strange terminology, no time shifts, no unreliable narrators and alternative histories. She does not mention fairies, spirits or imaginary kingdoms, or invented objects or concepts. The story is set in the now, not in the future. She places the troll, a mythical creature, as squarely in reality as any animal in the home. She includes references from history books, Biology handbooks and scientific journals, which Angel, the finder of this creature, reads because he is simply practically concerned with his find’s diet – what does a troll eat? I checked some of the references, not all, and those I checked were real, not made up, such as the references to The Unkown Soldier by Väino Linna, and the song Goldwing and Troll or Silkkinen ja Peikot, by Anni Swan. Illustration of Pessi by Jenny Wiik, from Not Before Sundown by Johanna Sinisalo, for Archipelacon, the Nordic SF & Fantasy Convention 2015. Ah, who wouldn’t want to have a troll like this in the house? It’s like owning a piece of magic. In an effort to feed the troll, Angel involves other people like his neighbour, the down-beaten internet bride “Palomita”; “Dr. Spiderman”, a caustic-tongued veterinarian; his former lover, “Martti”, a powerful art director and Angel’s boss; and “Ecke”, who is in love with Angel. The novel’s point of view shifts between each of these characters. Each responds differently to the clues they pick up about the alien creature in Angel’s flat. And “it” recovers, and like a phoenix, becomes stronger and more beautiful and smarter by the day. Angel is doing what humans have done since time immemorial – if they see something they find really beautiful, they want it for themselves. But is that the only reason? The troll gets a name, “Pessi”, and a gender, a male. Pessi is more than a foundling by now. In at least the first half of the book, Pessi is so sick he almost dies, and Angel cannot figure out what’s wrong with him. But then Pessi recovers and grows strong: “…he moves about like oil, as if made of silk”, poops everywhere in the flat to rile Angel, and guards Angel jealously. He learns, and he hunts. He smells other males’ smells on Angel. Moreover, Angel loves Pessi and he knows that, in the reverse of “Baloo the Bear” having to leave “Mowgli” to get back to the man village in The Jungle Book, this feral “person” will have to go back to the wilds. Worse, Mikael is hypnotized, and as time goes on, becomes ever more base in his actions and plans to keep Pessi with him. Who is the animal here? And there, dear reader, is the very problem. What is love?, asks Sinisalo from us. What do we love, and why and what will we do if we have something we truly love? Will we give up our lives for that person, that thing or that cause? Society sets limits on what we can and cannot love, sometimes with good reason. But if something is not categorized, or does not officially exist, is perhaps a figment of imagination – a fiction – can one still love it? Is love real if it is one-sided and there is no common language with which to connect intellectually? The whole situation is untenable of course. With love comes desire. Then it gets creepy. The reader reads on, with a sinking sense of approaching doom. And the climax of the book is indeed a terrible shocker. Considering what Angel does with Pessi in order to get Martti to love him, it got me wondering who is the child of the light and who is the child of the night. In terms of dire consequences, much more happens than just Angel finding Pessi. The plot is complicated by the narrative from points of view of people who “come to a bad end” so to speak. When you die, after all, you think no more, you have nothing more to say. The text, on these pages, just end, with one-liners. One’s imagination does the rest. And as for Angel, you have to read for yourself. It will take your breath away. “They [the trolls] are on their way back and doing what the sparrows and pigeons and rats do – living alongside us, whether we like it or not. They’re eating our leftovers, they’re even stealing a little, and sleeping in our abandoned buildings and barns, as in the tales. They’re pushing out their own territory into ours, little by little, so we’ll not even notice until they’re already in our midst.” (p.267). Do you recognize anyone like that? Perhaps someone sleeping on the street downtown, the person with their hand out, sitting in a heap, the person who sounds and looks as foreign as a troll amongst city folk. “Le cœur a ses raisons, que la raison ne connaît point. On le sent en mille choses. C’est le cœur qui sent Dieu, et non la raison. Voilà ce que c’est que la foi parfaite, Dieu sensible au cœur.” (Blaise Pascal, Pensées, IV.277, p. 458 in Léon Brunschvicg (ed. ), Blaise Pascal: Pensées et Opuscules (Paris: Classiques Hachette, 1961). Whether by “heart” Pascal meant subconsciousness, and by “reason”, logic or consciousness, it is true, at least for me, that love – that what you feel – like faith, is often without logic, reason, or rationale. It is what it is. Sinisalo here demonstrated perfectly that love happens in the oddest of places, to the most unlikely people. She also demonstrated that the world is a cruel place to people who are different, who love differently, who are either lovers of trolls, or trolls themselves. Almost in negation of all the proof, literary, anecdotal, historical and scientific, about the existence of trolls that she inserts into the novel, it is the love that Angel feels for Pessi that drives him to his ultimate decision. No reason. Just the heart. What can I say about this novel? It’s haunting, marvellous, really refreshingly different. Go read it. At least before you kick the bucket. Sing along to the Youtube video! Goldwing left her sisters there. out of his all darkened cavern lair. but little trolls in daytime can’t be found. and never see the daytime light. to have the Goldwing for his own. and would be happy with a lover bold. or knew what love was all about and why.